Have you ever gotten frustrated in your relationships with your loved ones? You're trying to get through to the other person - be it your partner, friend, or family member - but somehow something gets in the way. Attempts to connect seem to drive you further apart from each other; even though you love them deeply, the other party does not seem to get the memo. Marriage Expert John Gottman sheds light on four patterns in frustrated relationships that seem to foster disconnection, not connection. These patterns are named, "The Four Horsemen of the Apocalypse," since their persistent presence signal the end times for the relationship. Criticism: Offense is the best defense. Attack before you get attacked. Defensiveness: Dismiss the other and point the gun back on them. Contempt: Hit 'em where it hurts. Make the other feel small and insignificant. Stonewalling: Abandon ship. Terminate engagement. Needless to say, each attempt to self-protect ends up slamming the other person's shame button, stirring up more fight, flight, or freeze. Each interaction ends up deepening feelings of hurt, rejection, betrayal, and abandonment. 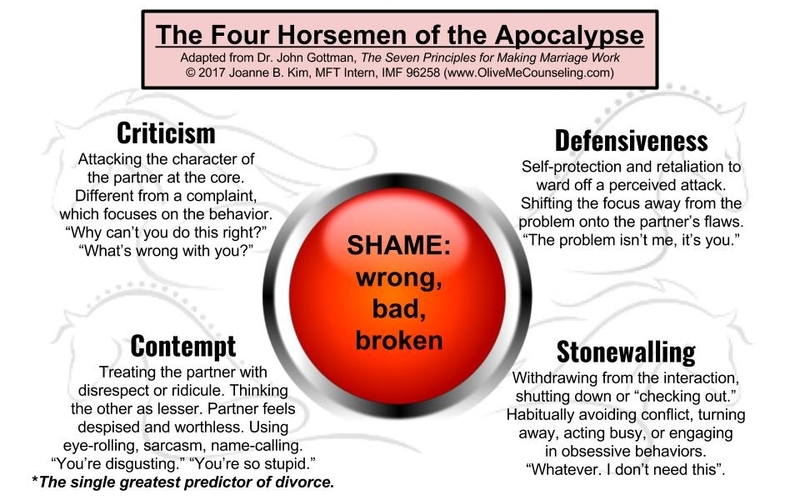 Over time, these toxic patterns erode the bond of trust, safety, and connection, thereby creating more room for the horsemen and less room for repair. The cycle of pain continues until the rupture is so deep, they cannot remain connected, let alone be in the same room anymore. Do these show up in your relationships? Which horseman sounds most familiar? Though it is incredibly difficult to change these relationships, it is not impossible. You can replace each horseman with its respective "Antidote" to reverse the deadly cycle and bolster the relationship. To learn about the Antidotes, click here.